Images 4 Kids Children's Photography franchise business opportunity. Free Images 4 Kids Children's Photography business franchise information. Do you love photography? Do you enjoy working with children? Our company specializes in providing daycares and private schools with high-end, studio quality portraits. 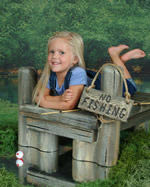 We photograph children ranging in ages from infants to 5 years old. There is a certain magic working with young children and capturing perfect images that will become treasured memories. You will enjoy hugs, kisses & laughter...and for this, you get paid! Images 4 Kids is a family oriented, home based business and our main goal is to personally help each of our franchisees succeed beyond their wildest imaginations. Our franchise support team and ongoing training programs will help you with constant and continuous growth. Territories are selling out fast! Don't miss out on this great opportunity! Each franchise owner is allotted an area in which no other Images 4 Kids franchise is awarded. Even if you have no previous experience in photography, don't worry. We will provide you with complete training, marketing, management support and the equipment necessary to maximize the potential of your Images 4 Kids franchise. We're committed to the ongoing development of new opportunities to maximize your profit potential, and technology is often the key. Images 4 Kids offers a tremendous advantage over the traditional film based photography by providing a digital photo system. You will have the ability to provide the limitless potential of digital graphics with superb quality without the hassle and expense of purchasing, developing, sorting, enlarging, and mailing film. Additionally, Images 4 Kids offers a proprietary e-commerce system that represents the latest technology for online photography ordering systems. Images 4 Kids online ordering system gives parents the option to view proofs and order their children's portraits on the internet. It's secure, safe and convenient. What does this mean for you? More sales, more profits, and a competitive point of difference! Our number one priority in everything we do is maximizing your return on your investment. We offer to you our proven system based 24 years of experience. But we know we are only of value to you if we continue to make smart, strategic decisions in the areas of selecting new franchisees, enhancing our marketing programs, developing new markets, evolving our systems, and building the Images 4 Kids brand. We take a new, more personal approach unlike any other franchise corporation. Once you become a franchisee you become part of our family. We do not charge royalty fees. All the money you make is yours to keep. We make every effort to ensure the success of every franchisee in the Images 4 Kids family. Our success depends on your success! Just imagine how rewarding it will be to take control of your own destiny while providing smiles and memories that last a lifetime. If you enjoy working with children…this could very well be the opportunity you have always dreamed of. An Images 4 Kids franchise can give you the opportunity to achieve your goals of personal and financial independence. If you are ready to step out of Corporate America and pursue your own dreams now is the time. See what Images 4 Kids has to offer you! To learn more about the Images 4 Kids Children's Photography franchise opportunity, simply complete the form below.